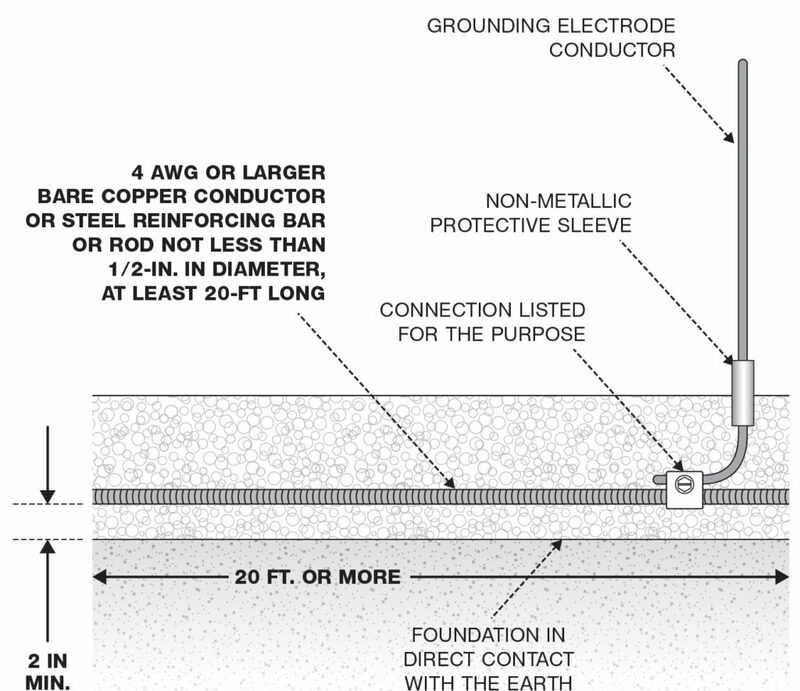 What are the NEC Requirements for Earthing and Bonding Rebar? Thank you for your question regarding the mandatory bonding of steel rebar, It is our pleasure to help. The National Electrical Code (NEC) requires that all normally non-current-carrying metallic objects in a given structure be bonded together to form a single common system that is at the same potential. This includes the steel rebar in the concrete foundations. We see in Article 250.50 the mandate that all electrodes listed in the code (steel rebar in concrete can sometimes qualify as an electrode) be bonded together, whether they are used as an electrode or not. In the case of steel rebar in concrete, we see in 250.52(A)(3)(Information Note) that epoxy coated rebar and/or a vapor barrier can negate our ability to use the rebar as an electrode, however our mandate to bond the systems to form a common system still remains under 250.50. 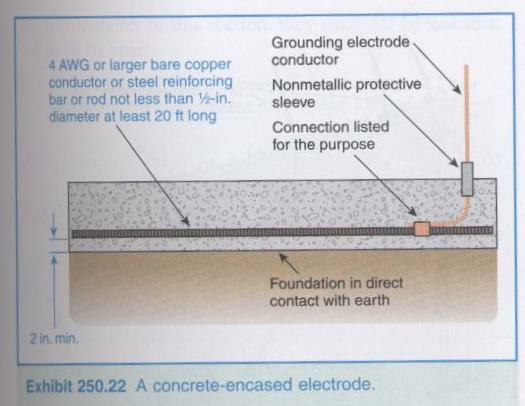 In other words, you must bond the steel rebar in concrete foundations whether you use it as an electrode or not (just like water pipe, gas pipe, alarm system, fire sprinklers, CATV, Telco, etc). Please see the NEC 2017 Handbook Exhibits: 250.22, 250.23, 250.29, and 250.30. Many people are concerned that bonding the steel rebar in concrete may lead to cracking of the concrete due to thermal heating. It is a very counterintuitive concept, but it’s actually the exact opposite. We also see hesitation when people are instructed to bond their gas pipes to the Earthing and lightning systems (NEC 250.104(B), 250.52(B)(1), and NFPA 54 Section 7.13) as well. Note: Lightning systems must be bonded per NEC 250.106, 250.4(A)(1), 250.4(B)(1), and NFPA 780 Section 4.14. By removing the difference in potential, we remove the electrical risk. If we do not bond the rebar in concrete, we generate a difference in potential between the concrete and the bonding metal objects inches above, which will allow arc-flash to occur, which will cause severe damage. Consider the lightning protection system requirements to bond metal window flashing to a down conductor so as to prevent arc-flash. Please see NFPA 780-2014 Sections 4.9.13, 4.13.3, and 4.19 for more information regarding bonding steel rebar. Note that concrete is an electrically conductive medium, typically ranging between 30 to 200 ohm meters (See IEEE Std. 80-2013 Section 14.6), so arc-flash between objects with differences in potential is a dangerous and real concern. In your case, your steel rebar has a copper earth loop at the very bottom of the system. Any hazardous currents that enter the copper wire will want to stay on the copper component and go into the earth through the easiest path. By bonding the steel rebar you simply eliminate the difference in potential between the metal objects above the steel rebar and the steel rebar, you are not forcing current to travel through it to find a path to earth. Hazardous currents have a path to earth, the massive buried copper network and Earthing electrodes. Remember, copper is 12 to 17 times more conductive than steel and is additionally 250 to 6,000 times less magnetic. In fact, copper is diamagnetic. Meaning that the steel is high-impedance in relation to the copper. In addition, we have to consider IEEE Standard 80 and human safety. The steel rebar in the concrete IS THE SAFETY MAT for eliminating hazardous step and touch voltages. It MUST be bonded. If the steel rebar is not bonded, you would need to install a copper Earthing grid under the workers feet in order to keep them safe. You may want to contact whoever did the mandatory OSHA 29 CFR 1910.269 App C Step & Touch analysis and see what they have to say about workers walking on top of concrete pads with un-bonded steel rebar. They will not be happy. Please see IEEE Standard 80-2013 Section 14.6. You may also want to consider looking at (Canadian) CEC Rule 36-304 and Figure 36-11, which is in full compliance with the NEC and IEEE 80, and very clearly spells out the mandatory steel rebar bonding, with illustrations and code. We additionally see requirements for bonding steel rebar in concrete in IEEE 1100 (Emerald Book) Section 8.5 and IEEE 142 (Green Book) Section 4.2.1 and 4.2.3. Magnetic build up, harmonics, transients, EMI/EMF and other objectionable currents that can build up on steel rebar will need a path to earth. Moreover, have a number of sensitive electronics systems on site. Please see Motorola’s R56 standard, ATT-TP-76416 standard, and ANSI/TIA/EIA-J-STD-607-C for additional steel rebar bonding requirements related to the data communication systems. Finally, we can see a list numerous standards from the International Electrotechnical Commission (IEC) which would additionally agree with the requirements to bond steel rebar in your electrical system. 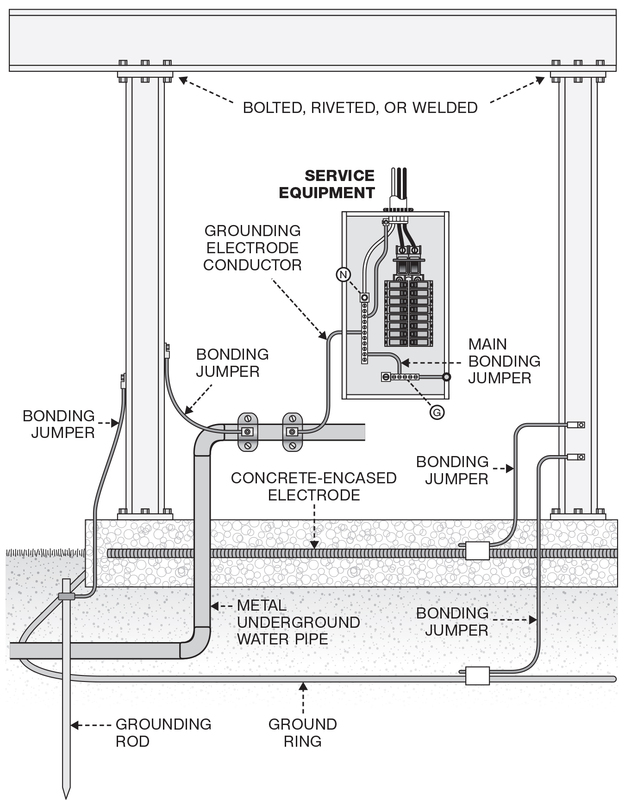 When did the National Electrical Code require earthing/bonding for swimming pools? We are being instructed to use the UFER earth in addition to the equipotential earthing system surrounding the building and attached to the rebar in the foundations. We are located in Jacksonvill Fl where the water table is 4’ below grade. Is the use of a system designed for New Mexico a good addition to the above mentioned earthing systems? Bought a 40X24 Metal frame with metal sidings building. No Elec or plumb at present, maybe later. Inspector requires earthing Metal Building. 1×5/8”x8’cu clad steel rod ok tied to Botton I-beam? Plan to use a rebar in slab to tie to metal frame in another place. Can all steel rebar be welded? Feel free to ask a question about electrical earthing or electrical engineering. 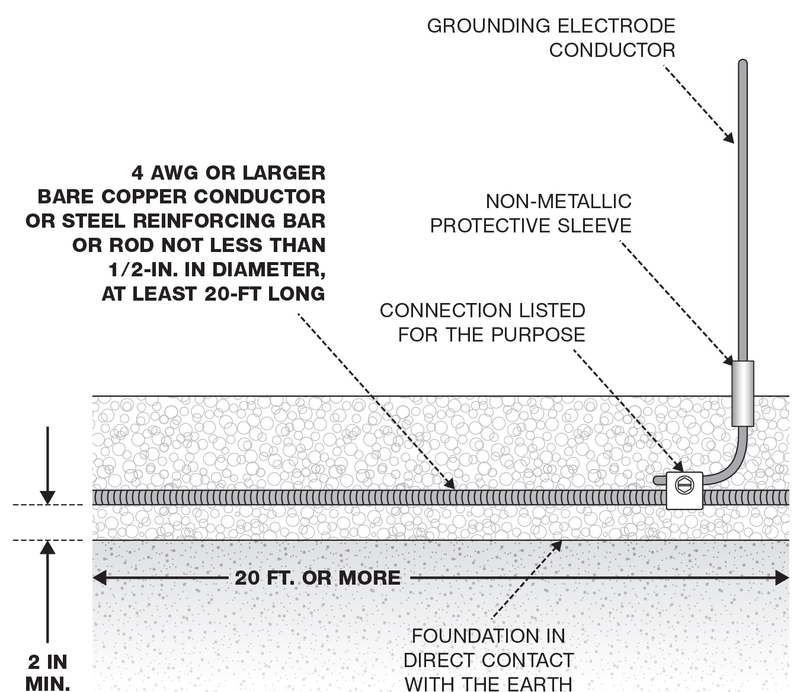 Why use a bare conductor for below ground earthing instead of an insulated conductor?